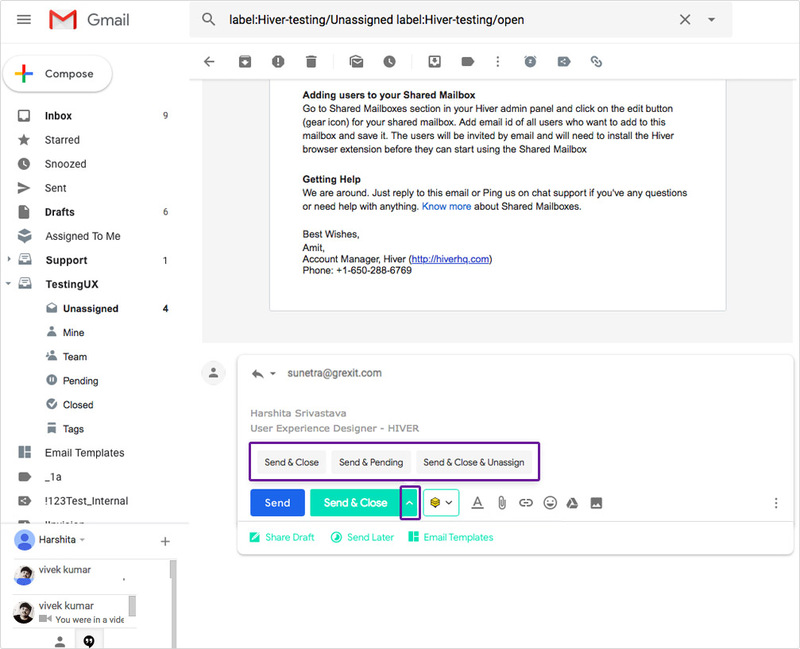 Every user can see the Shared Mailboxes in the left Gmail pane. In the following screenshot 'Support' is the Shared Mailbox. An email that has reached the Shared Mailbox can have any of these three states. This is the default, initial status of an email in a Shared Mailbox. In other words, when a new email comes in a Shared Mailbox, then it is in the 'Open' state. The 'Open' state indicates that the email needs your attention. When an email/ email thread has reached its logical resolution, then the user can change its state to 'Closed'. The 'Closed' status indicates that the email is resolved. You can set an email/ email thread to 'Pending' state if you are waiting to hear back from a customer, or you just need to time to gather more information. This status can be set on emails where you have sent a reply but the complete resolution has not been done. An email/ email thread can be in any one state (Open, Closed or Pending) at a time. Click on the dropdown on the Hiver widget on the right pane of Gmail to choose any option (Open, Closed or Pending). When any new email reaches the Shared Mailbox, it appears in the 'Unassigned' section of the Shared Mailbox for all the users of the Shared Mailbox. You can assign an email to yourself or anyone else in your team. Emails sent to the Shared Mailbox don't appear in the Gmail Inbox of a user until the email is assigned to the user. Click on the dropdown 'Unassigned' in the Hiver widget on the right pane of your Gmail to find a list of all the users in the Shared Mailbox to whom the email can be assigned. Select on any user to assign the email to. When you assign the email to someone, it disappears from the 'Unassigned' section of the Shared Mailbox and appears in the Team folder of the Shared Mailbox. The person to whom you have assigned the email will also get a notification in their Gmail. You can even 'Unassign' an email by selecting 'None'. 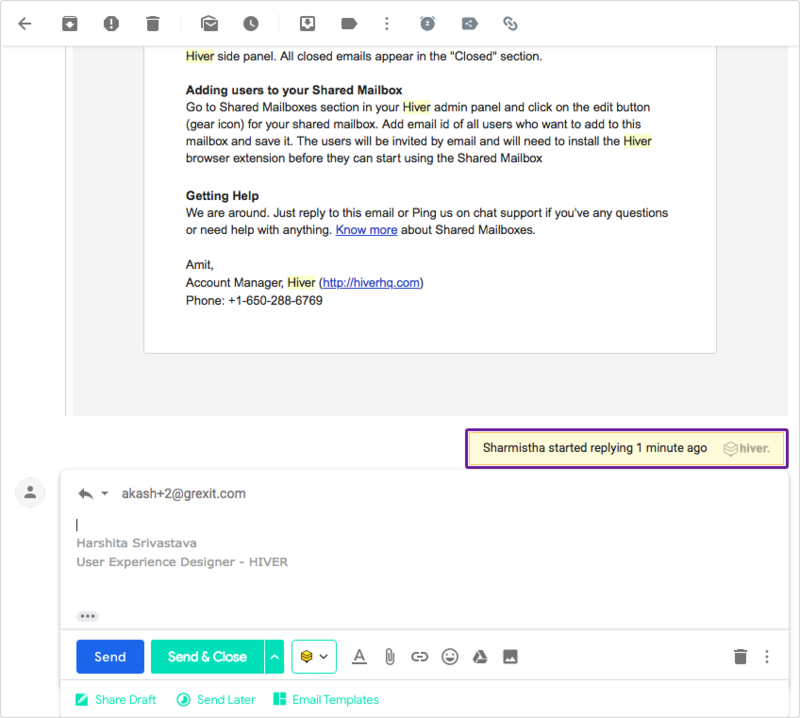 When a new email arrives on a Closed email thread, Hiver will automatically 'Open' the whole thread under the name of the user to whom it was last assigned. The email will also show up in their Inbox. When a new email arrives on a 'Pending' email thread, Hiver will automatically 'Open' the whole thread under the name of the user to whom it was last assigned. The email will also show up in their Inbox. While replying to or composing new emails, you can have the email id of the Shared Mailbox as the Sender's id. Please note that this works only if your email id is already set up to send emails from the Shared Mailbox id. To learn more about this, please visit here. Emails sent using the Shared Mailbox email address will automatically get added to the Shared Mailbox as Unassigned and Closed. d. Send and Close and Unassign : Send the reply, change the state to 'close' and 'unassign' the email. You will be able to see the options by clicking on the small arrow to expand the dropdown. Hiver remembers the last action and displays it as default option when you reply to the next email. 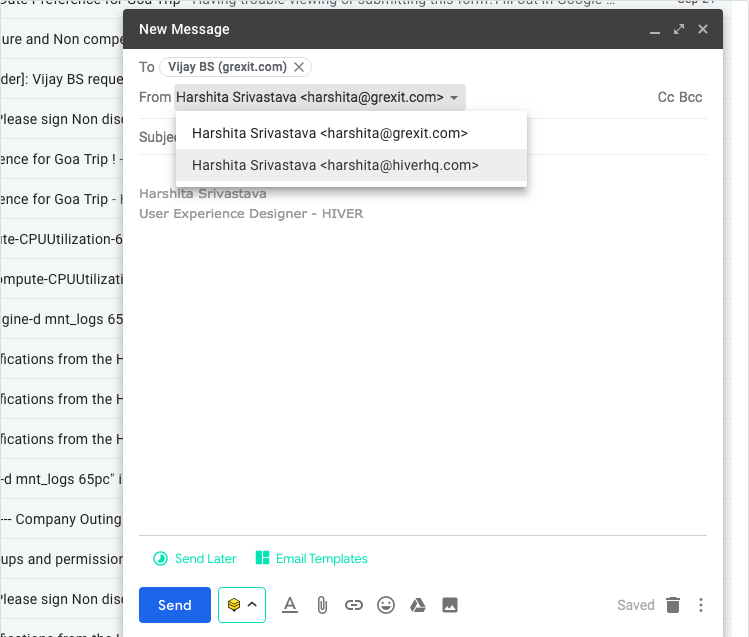 If a user starts replying to an email and navigates away; or closes the Gmail tab without sending, or trashes the email, then the collision alert immediately disappears for other users. If she starts replying again, the collision alert will come back for the other users. If a user starts replying to an email and puts her laptop/pc in sleep mode, then the collision alert will be visible to other users for the next 10 minutes only.